"My grandfather told us the McIninch family was Scotch-Irish (Orangemen) belong to the Gordon Highlanders." "It has been difficult to trace the McIninch family. I have heard there may be people in Canada by the same name. This I am not sure." James is the earliest McIninch of our line. He was born in Ireland and had two children: John and Sarah. There was no information found on Sarah. John, the only son of James McIninch, was born in New York City, was reared and educated in New York City, and was a school teacher in Ohio and Missouri. Eason was a son of John McIninch. He was a pioneer in Oregon in 1852. He was unmarried and left an estate including 160 acres which had been given him by the United States Government. Charles was a son of John McIninch. He was named after his maternal great uncle, a prominent and wealthy New Yorker, who (in 1904) had one of the finest monuments that adorned Greenwood Cemetery in New York City. 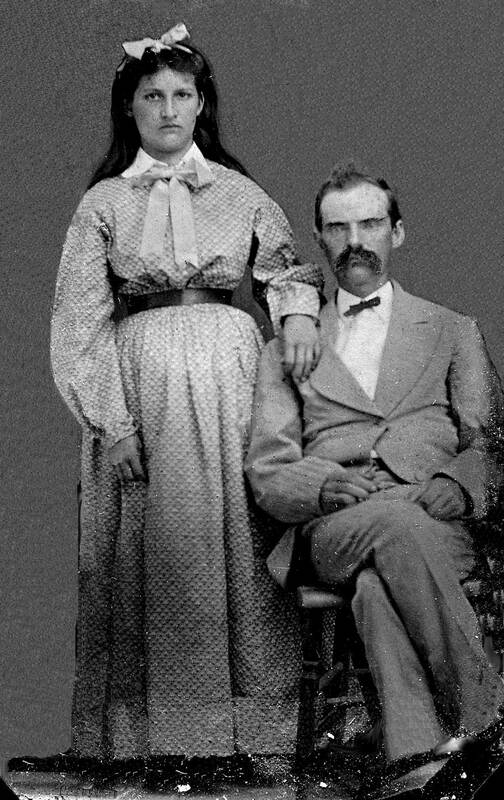 Charles and his wife lived in Missouri. After the Civil War, they moved to Hillsboro, Texas - probably about 1869 or 1871. It is not certain how long they lived in Texas, but not many years before they decided to move back to Missouri. Travel in those days was usually by covered wagon; a slow mode of travel. After they crossed Red River into the Chickasaw Nation, somewhere near the little town of Lebanon, Indian Territory, the horses died. They were stranded and in a really bad way. One day a group of Chickasaw Indians on horseback rode up. They sat for awhile looking over the situation. The McIninch family had no idea what the Indians might have in mind. They were all strangers. After awhile one spoke, "Um. Bad." Charles McIninch agreed. The the Indian spokesman said, "We got horses, work them. We got land, work it." Charles McIninch leased land from the Indians and lived near Lebanon, Indian Territory many years. 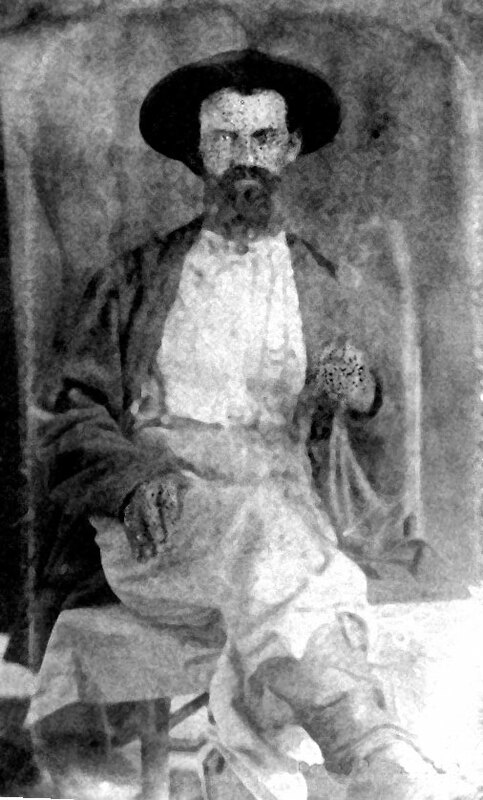 Charles and his family loved their Indian friends, and enjoyed living near Lebanon. After the Pottawatomie land was opened to settlement two of the McIninch boys, William and Lewis, went to Pottawatomie County and became interested in moving there. They bought some land and went back to Lebanon and after much discussion and persuasion succeeded in getting their father to move to Pottawatomie County with them. He went very reluctantly. He missed his Indian friends. Anna Rosalie McIninch was about seventeen years old when the move was made, about 1894. The original post office application for Wanette was made on August 12, 1893, and was approved on March 19, 1894, with Charles Postly McIninch as the first postmaster. At his death, he left a family of sons and daughters who are now scattered throughout the southwest. Aesop was the maternal grandfather of Charles Postly McIninch and among the oldest inhabitants of Wayne Township, Tuscarawas County, Ohio. I Aesop Johnson of Wayne Township of Tuscarawas County, and state of Ohio do make and publish this my last will and testament. Item 1st. I give and devise to my beloved wife in lieu of her dower, the one third of the place on which we now reside as long as she remains my widow, or in lieu of that if the place is sold the interest of six hundred dollars annually as long as she remains my widow, and all the stock, household goods, furniture, provisions and other goods and chattels which may be on the farm at the time of my decease. She however selling so much thereof as may be sufficient to pay my just debts, but if my wife should not survive me then I devise and bequeath the property aforesaid to my children equally and their heirs forever. Item 2nd. If after my decease the heirs wish to sell the place or farm or other property, they may do so and divide the proceeds thereof equally among them my lawful heirs. All but my daughter, Sarah McIninch, her share it is my will that that be secured to her as long as she lives and at her death to her children in such a manner that her husband can in no wise get hold of it. In testimony whereof I have hereunto set my hand and seal this fifth day of June A.D. 1850. Signed and acknowledge by said Easop Johnson as his Last Will and Testament in our presence and sealed by us in his presence. I wish the following to be a part of the foregoing will - I do hereby appoint Amos Johnson Executor of this my last will and testament, this 5th day of June A.D. 1850. We Albert Bates and Joseph Rosenbury being duly sworn in open court, this 28th day of October A.D. 1853, depose and say, that we were present at the execution of the last will and testament of Easop Johnson hereunto annexed and of the codicil thereto, that we saw said testator subscribe said will and said codicil, and heard him publish and declare the same to be his last will and testament, and that the said testator, at the time of executing the same was of full age and of sound mind and memory, and not under any restraint; and that we signed the same as witnesses at his request and in his presence and in the presence of each other. In the matter of Easop Johnson's will. The last will and testament of Easop Johnson late of County of Tuscarawas deceased was this day produced in the Court of Probate and Albert Bates and Joseph Rosenbury the subscribing witnesses to said will appeared and in open court on oath testified to the execution of said will, which testamony was reduced to writing and by them respectively subscribed and filed with said will. It is therefore ordered that said will be admitted to probate, and the same together with the testimony recorded. And it is further ordered that letters Testamentary with the will annexed issue to Amos Johnson the Executor named in said will, that he give bond in the sum of four thousand dollars ($4,000) with Albert Bates and Isaiah Johnson as sureties who are approved as such. Isaac Hochstetler, Peter Fleck, and Christian Strong are appointed Appraisers of the personal estate of said testator. And thereupon appeared Rosanna Johnson, widow of said Easop Johnson and declined taking under the will of her deceased husband. Benjamin was a son of John McIninch. He homesteaded a farm near Auburn, Nebraska. 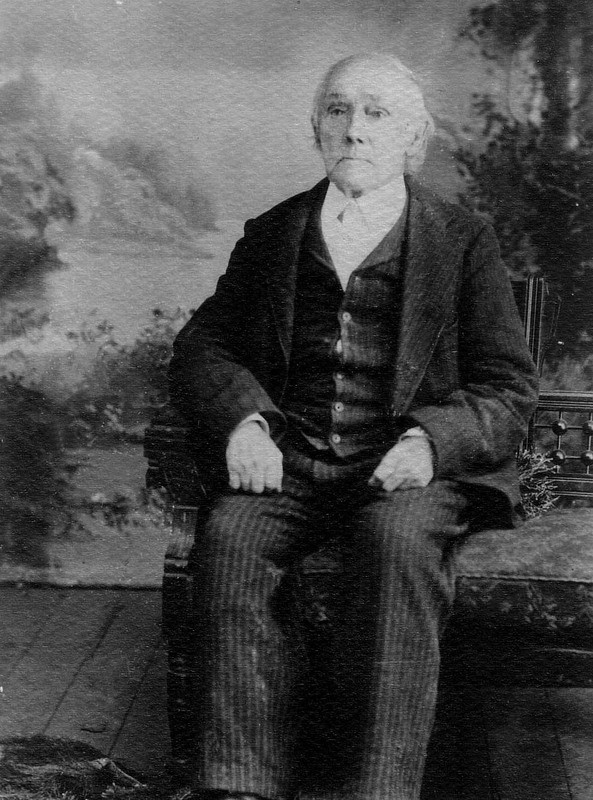 John, eldest son of Benjamin Franklin McIninch, is a native Nebraskan, born in Nemaha county, where his parents were original homesteaders, February 17, 1863. He is a son of Benjamin Franklin and Eliza Jane (Kennedy) McIninch. The father, who was a pioneer of pioneers in Nebraska, was a native of Ohio, born in 1833, and was married in Missouri about 1854. In the fall of 1856 he and his wife came to Nemaha county, Nebraska, being practically driven from Missouri by the guerilla warfare then being carried on there, as he was a union man. They made the trip with a yoke of two year old steers with a wagon and camping outfit and carrying fifteen cents in money. They landed in Nemaha county amongst the Indians, as at that time there were but very few white settlers in that part of the state. They still reside on the farm where they first located and Mr. McIninch has aided in the development of his part of the state from frontier days, when it required high courage and good common sense to cope with existing conditions. He and his wife spent their first night in Nemaha county in a log cabin owned by a family of Germans who could not speak English. As Mr. McIninch and wife could speak no German their only conversation was carried on by means of signs. Neighbors were then few and far apart. They deserve great credit for overcoming the many trials and discouragements that come to the first settler in any country and in this way helping to pave the way for later generations. In 1862 Mr. McIninch enlisted in the army for frontier service and passed through the dangers incident to the soldiers who protected the frontier and looked out for the interests of the white settlers. He had a comrade who was scalped by the Indians, but who is still living. William was the fourth child of John McIninch. The following information was published in the Biographical & Genealogical History of Southeastern Nebraska, Volume 1, by Lewis Publishing Co., 1904, Southeastern Nebraska, page 93. William H. McIninch, a retired farmer in Auburn, with a fine farm in London precinct, Brownville post office, is one of the oldest living settlers of Nemaha County and likewise one of its most successful farmers and business men. He began life in youth with no capital, and since earning his first money his record has been one of constant progress. He has been one of the large landowners of the county, but most of it has either been sold or allotted to his children. In addition to his material property, he has been generous with personal work and means in aiding the cause of religion and education, and has never failed to give a good account of himself in whatever relation he has been placed with society and his fellow citizens. Mr. McIninch was born in Tuscarora County, Ohio, March 20, 1836. He was reared on a farm, having limited educational advantages in the primitive schoolhouses of the time an locality. At the age of seventeen, soon after his Mother's death, he left home and went with Hux Bivens to drive stock across the plains to Oregon. It took four and a half months from St. Joseph, Missouri to Albany, Linn County, Oregon. From there he went to the northwest corner of California in the spring of 1854. He was engaged in placer gold mining there until the fall of 1857, and then returned home by way of New York City, and in the same fall came to this part of Nebraska and preempted the one hundred and sixty acres which still form part of his farm, paying for it with a Mexican land warrant. There were few settlers here then, the nearest neighbor being a mile away. The landscape presented a picture of undulating stretch of prairie, covered with wild flowers and grass, and was a dreary scene to one accustomed to the roll and woodland of more eastern states. He made his first dwelling of one room, built of poles, and with one door and one window. Its dimensions were fourteen by sixteen feet. He later helped a squatter prove up some land, and received a deed for forty acres on Snow Island, on which he build a log and mud cabin. In 1860, soon after his marriage, he bought seventy-five acres one mile southwest of his place, for one thousand dollars, and his later purchases were five acres of timber on the bluffs near Brownville for one hundred twenty-five dollars; forty acres of timber for two hundred and fifty-five dollars; eighty acres of prairie southwest of this farm for two thousand dollars; eighty acres west for eighteen hundred dollars; eighty acres of improved land for fifteen hundred dollars. eighty acres purchased in 1894 for thirty-six hundred dollars, forty acres one mile south at fourteen hundred acres, and in 1901 he purchased a half block in Auburn on which he has erected a beautiful home for his permanent residence. He paid two hundred and seventy-five dollars to the Cumberland Presbyterian Institution, Missouri Valley College, at Marshall, Missouri, and has a lot there on which he has paid taxes for ten years. He has sold and traded a great deal of land, and his present farm consists of three hundred and sixty acres, and in the family there are over fifteen hundred acres, with eight sets of buildings. Mr. McIninch, with the help and cooperation of his wife, has made all he has. He earned his first money by working on a farm in Missouri for Tom McDonald at ten dollars and fifty cents a month. The second house which he built in Nebraska was of hewn logs, and it is now doing duty as a stable. This was replaced by the present brick, story and a half, house which was built twenty-three years ago, and is beautifuly surrounded with flowers and groves which make it a bower of beauty nearly all year. He has an apple orchard of ten acres, besides a large variety of other fruits, especially peaches. He has sold one ten-acre orchard, and has two others, and has planted twenty acres to fruit. His leading crop is corn, of which he plants from one hundred to two hundred and fifty acres, and from one hundred and six acres in 1902 he sold 5,750 bushels. He has often raised as much as ten thousand bushels of corn. He and his wife are about to ensconce themselves in the new home in Auburn and the maiden daughter and the youngest son will remain on the farm and manage it. Mr. McIninch volunteered on July 6, 1862, at Brownville, Nebraska, and was enrolled in Company C, Second Kansas Cavalry, with which he saw service until the close of the war, for three years. He was under Generals Blunt and Steele in Arkansas. He was captured at Poison Springs, and was held prisoner for nine months in Tyler and Camp Gross, Texas. After his capture he knew he would be reported among the dead, and he took the first opportunity to ingratiate himself with the Confederate officers, who permitted him to send a letter to his young wife, informing her of his real circumstances. The prison experience was the worst of all his life, and he suffered every physical torment except death. Two hundred and ten of his companions were in misery dying of disease, mostly of yellow fever. He was finally paroled and sent north, being mustered out at Fort Gibson, Indian Territory, and paid off and discharged at Lawrence, Kansas. The government paid him for his horse and equipment and the clothing he had lost, and he also received twenty-five dollars a month while in service, having furnished his own horse. He also got four dollars a month pension, which was later raised to eight dollars, and is now twelve. Mr. McIninch now votes the Prohibition ticket, having come over from the Democratic ranks. He is one of the surviving members of the Grand Army of the Republic. He has been a school director, but has had little time for active participation in public or political affairs. He and his wife are members of the Cumberland Presbyterian church, and the children have been baptised in the church. He is an elder, and has been a member of the assembly three times. Catherine, wife of William Huett Mcininch, came with her family in 1856 by water as far as Omaha, then to Atchison County, Missouri. Levi was a son of John McIninch. Levi was a teacher, and died in the prime of life while at work in Canton, Ohio. Catherine was the sixth child of John McIninch. She was an ardent worker in the Presbyterian Church. She died at the age of twenty-three while living with her Aunt and Uncle Caldwell in New York City. Amos was a son of John McIninch. He was wounded during the Civil War, losing an eye and having a silver plate as part of his skull. David was a son of John McIninch. He was a farmer east of St. Joseph, Missouri. Amanda was a daughter of Charles Postly McIninch and she died in childbirth with her first child. James was the eldest son of William Huett McIninch. and in 1904, was a farmer in southeastern Nebraska. Willa was a daughter of William Huett McIninch. She was born while her father was in the Army and was named after her father and her mother. David was the second son of William Huett McIninch and in 1904, was a farmer on the Auburn road. Clara, third daughter of William Huett McIninch, had six children living as of 1904. Mitchell was the third son of William Huett McIninch and in 1904, was an attorney in Auburn, Nebraska. Barnett was the youngest son of William Huett McIninch. He was on the home farm and in partnership with his father, William. Glen is the grandson of William Huett McIninch; his father is James Henry McIninch. The following is an article from the Sunday World Herald, Omaha, Nebraska, June 27, 1976. The Nebraska Masonic Home in Plattsmouth will soon receive about five million dollars from an Omahan's estate. The Omaha Home for Boys and the Omaha Home for Girls each will receive about $1.6 million. The three homes are to receive the largest portions of the estate of Glen W. McIninch, a businessman who died last July. "We are terribly pleased to be remembered by Mr. McIninch in his Will", said Bill Patterson, president of the Masonic Home. "We have received many endowments in the past, but this is certainly the largest from any individual or corporation." The money will go into the home's endowment fund and only the interest, not the principle, will be spent, Patterson said. This could be between from $300,000 to $350,000 annually, he added. Similar expressions of thankfulness came from officials of the girls and boys homes. Who was the man who lived in and around Omaha for eighty years, quietly amassed an estate of just over ten million dollars, then gave most of it to charities? Mr. McIninch was a Brownville, Nebraska farmboy who went from high school dropout to self-made millionaire. Starting as a garage mechanic, he rose to become owner of the Auburn, Nebraska Machine Works Company, McIninch Investment Company, McIninch Motor Parts Company and Miller-Knuth Manufacturing Company. He lived a comfortable life, but by no means that of the stereotyped millionaire. At the time of his death last July he had only $12,000 in life insurance and $5,000 in stocks (General Motors). He and his wife traveled little. His life was dedicated to his businesses. His concern for money was "his only hobby, his raison d'etre", said Omaha attorney Varro Rhodes, McIninch's friend and co-executor of his estate. Irene Anderson of Omaha, "Mack's" personal secretary for more than thirty years, said his zeal for work - coming daily to his Omaha office and traveling to Auburn three or four times a week - went back to his childhood on a Brownville farm. His family's situation fluctuated between wealth and poverty, there never was a middle ground, she said. When the father died, the famly was poor and the son vowed he would never be without money. At fourteen, McIninch quit school. His father told him if he didn't go back to school he'd have to work. "Mack's father didn't have to tell him to work, he would have done so anyway", said John Skaggs, friend and general manager of the machine works. McIninch's first job was working in a Brownville auto repair shop. He then operated an auto company in Brownville before the United States entered World War I. He served as an Army vehicle maintenance instructor, and after discharge, moved to Omaha. He sold cars, but when the Depression came, sales declined and he sought work as a mechanic. One manager told him if he could fix a farm machine by the end of the week, he'd have a job. McIninch worked twelve hours a day, got the machine to running, the manager offered him twenty-five dollars a week and McIninch was on his way, a friend recalled. He became a Packard and Jeep distributor, then bought a motor parts company. In 1946 he bought a machine works which manufactured Jeep-a-Trench and Auburn Trenchers for installation of Jeeps and International tractors. For small farmers who couldn't afford large trenching machines, the Jeep-a-Trench was ideal. Since it was sold nationwide, McIninch's financial future was secured. McIninch was a quiet man who didn't have many friends. "Although he was not outgoing in social circles, he was anything but bashful in business", Mrs. Anderson said. "Mack was a perfectionist and he expected the same degree of perfection from his employees", she continued. Lawrence Bernard of Auburn, who often represented McIninch and is now auctioning off his twenty farms, said McIninch was a "shrewd businessman", and whose word "was as good as gold". McIninch was six foot two inches tall, broad shouldered and muscular. "When he looked at your, boy, you could feel those eyes of his scanning your entire body, penetrating your every thought", Bernard said. McIninch conservatism was legend, his friends said. "Mack wouldn't pay list price for anything and told me to always sit on the cash box with a shotgun across my lap", Skaggs recalled. Rhodes said McIninch also was a good draftsman who designed his "dream house" in Omaha, his plant in Auburn and family mausoleum in Brownville. McIninch married Josephine Olsen, an Iowan, when he was twenty-nine and she was twenty-six. They had no children. They rarely went on vacation. "Mack couldn't get away from his work", Rhodes said. "Whenever he did take a trip with Mrs. Mack, he always brought along a briefcase to do some work." Ten years ago McIninch suffered a heart attack. Four years later he had another, but he returned to work. When his wife died in 1974, McIninch grieved, Mrs. Anderson said. He remained in his house, alone. McIninch discussed his finances with Rhodes. "Mack hated paying taxes more than anything else". Rhodes recalled. "He felt that the government was not using the money properly, and, hence, it was all a big waste." His final Will designated bequests to three individuals and $20,000 each to a Brownville Christian Church, Brownville Historical Society, Lutheran Medical Center in Omaha, and Fontenelle Chapter No. 249, Order of the Eastern Star in Omaha. He also left a $100,000 trust for the care of the Walnut Grove Cemetery, site of the $75,000 family mausoleum. The remainder of his estate was divided sixty percent to the Masonic Home, twenty percent to the Omaha Home for Boys and twenty percent to the Omaha Home for Girls. In explaining the bequests, Rhodes said: "Since Mack did not have any children, and there were no relatives he was close to, it seemed only natural that the money would go to charities. At least in this way, Uncle Sam would not get a large chunk of Mack's money. This fact was especially pleasing to him. Mrs. Anderson said McIninch was proud to be a Mason, although he was inactive. "So much so that when he was presented with a fifty-year pin, he wore it all the time and it was buried with him." "Because of the Masonic ties and Mack's feeling that it is difficult to raise money for the elderly people, the home in Plattsmouth was a natural to receive the money", Rhodes said. Jean McIninch is the daughter of William Medford McIninch, granddaughter of Barnett Johnson McIninch, great-granddaughter of William Huett McIninch. The following article is from "The Voice'" Country Life Featuring Knotty Pine Farm, by Diane Simmer. Many people think that women's liberation is unique to the 1970's, and that the only significant thing happening to tie it to the past, being the passing of legislation which gave women the right to vote in 1920. How wrong these people are. And the best way to prove them wrong is to cite the fascinating past and present career of Ms. Jean McIninch, owner of Knotty Pine Farm in South Lyon, Michigan. Prior to 1958, Jean acquired a Liberal Arts degree (music major) and then played string bass with Ruth Coleman and her All-Girl dance band accumulating many wonderful memories. (One is reminded of the Tony Curtis - Marilyn Monroe movie "Some Like it Hot".) Jean likes reminiscing about those days and the thrill of touring the country as an independent young woman. At one point she played the ballroom in Topeka, Kansas and she also played with Flo Dryer in Puerto Rico. In 1958 Jean left the band to come to Michigan and ride polo ponies for John F. Ivory. Once again she entered a profession primarily reserved for men - and once again she made good at it. Her varied career then led to freelance riding at the tracks all over the country. Then in 1965 she met Joe Sciturro at the racetrack and found herself leasing a farm from him. One thing led to another and now Jean has built a comfortable home and finally settled down to a somewhat permanent residence at Knotty Pine Farm. She started her own horse business by boarding seven horses. Her farm has now grown to a center for breaking, breeding, boarding and training. All supervised by Jean herself. She now manages a forty horse stable including * * * * (the many horses which were named in the article were not copied). Her fifty acre business includes an indoor and outdoor track, nine paddocks and pastures all touch the creek running through the property. Aside from keeping busy with the horses Jean also studies genealogy and grows an organic garden. A possible explanation for Jean's determination could be traced to her family homesteading in Nebraska. At one point in her grandparents life in Nebraska a group of Indians offered six ponies for her grandmother. Obviously the deal was not made and Jean now carries on in her family's tradition of determination and strong character. An article featuring John Birdsong (a $7,500 a year director of recreation at Detroit's Sinai Hospital) who had always dreamed of owning a race horse. He bought Swift Don. Swift Don had a cracked cannon bone. Birdsong was laughed at about his horse and the slim chance he had of ever being a race horse. For seven months he worked with the horse without success. Birdsong heard about a woman trainer named Jean McIninch, who ran a small thoroughbred farm about two miles below South Lyon on Pontiac Trail. He moved Swift Don to her barn and Jean blistered the leg. She put a hot substance on the leg that drew blood near to the area and built up scar tissue. Swift Don's own blood and scar tissue began to heal and strengthen the bad leg. After one application, Swift Don stopped limping. Pretty soon, Miss McIninch was galloping the horse on her quarter-mile dirt training track, bringing him around slowly. But, she admits, "I didn't really think John was going to get that horse back to the races. He was a real sore horse." Jean McIninch is a hard-working, taciturn woman. Something has to go over seven on the Richter scale to excite her. She just kept blistering and galloping, bringing the horse along slowly, not worrying about if he would get back on the track or not. Just doing her job. In all, Swift Don has earned John Birdsong nearly $16,000 on the track. The rest of the article concerned Birdsong. "Birdsong is a celebrity with the patients at Sinai and with race fans all over the country. You should see the mail, says John. "I even got a proposal of marriage in the mail." But even more important have been the feelers from Hollywood. The fantastic story of a man named Birdsong and a crippled horse nobody but he thought would race again may just become a Walt Disney production. "It's just a dream, I just know it," says Birdsong. "But I don't want to ever wake up."